Hundreds of bloodied and bandaged victims are being treated outside damaged hospitals in the main city of Mataram and other hard-hit areas. More than 165,003 people were displaced by the quake and over 350 have been killed. So far 1447 people have been injured by the magnitude 6.9 earthquake. The death toll is expected to rise further as Local authorities, international NGOs and the central government have begun organising aid. 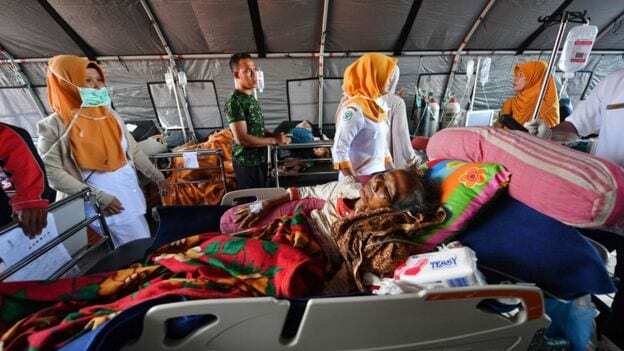 However, with the infrastructure taking a battering in the earthquake it has slowed efforts to reach survivors in the mountainous north and east of Lombok, which was hardest hit. Mobile clinics have been setup in the north of the island and field hospitals have been established in other areas. But even in the main city of Mataram, the injured are staying in non-sterile environments and facing long delays for treatment. As medical aid is only trickling through. Emergency personnel focused on evacuating the tourists to safety first. Indonesia, relies on tourism and a government initiative to focus evacuations on the tourism hot-spots was evident on the ground. The disaster management agency said on Tuesday that all of the 2,000 tourists on the Gili Islands had now been evacuated. The earthquake, magnitude 6.9 struck on Sunday evening in island of Lombok. So far rescuers have not been able to get to thousands of displaced Indonesians as they have moved to high altitude locations, fearing a Tsunami. The impact of Sunday’s quake is more devastating that the one which hit Lombok last week, killing 16 people.